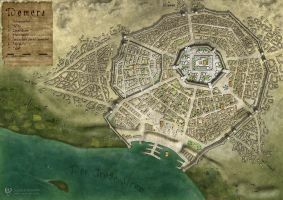 Citymap I created for the Erevos RPG campaign. You can check out their website at www.erevos.info and their fundraiser at www.indiegogo.com/projects/ere… . How much does something like this cost as a commission? is nature's rise over nature's run? We are moving on with our world Erevos and we cant wait to work with Djekspek again for more maps in the future!Our live events will create many more cities and areas of our dark world to be illustrated! When you have world builders, cartographers with the amazing skill of Djekspek is a necessity. hi, I'm not sure about these details, you'd have to contact the game developers for that, see the campaign details at the description. cheers! howwwwwwwwwwwwwwwwwwwwww i want to make maps this cool! I like all those mesas with buildings on top. Very cool design choice! So it wasn't something they asked to have in, just something you added? Still very cool. Beautiful! This is stunningly designed. This would be stunning in Minecraft! Wow this is truely stunning. I love it. What program did you use? It looks awesome. 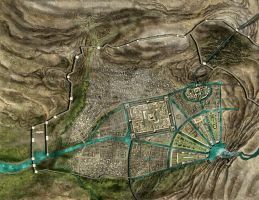 Do you have a tut for making city maps, curiously? This is one type of map that I've found tricky to learn how to make myself. Your skill is lovely. Great map! Love the style and the colors. Makes me want to play! I really love your style and your attention to details Very inspiring. thanks have to say your worldmap for the game is awesome! Also love the concept art they have on the locations, really hope they get it funded! oh wow, i love this, very stylish ! my work being inspiring is the best compliment I can get! thanks!